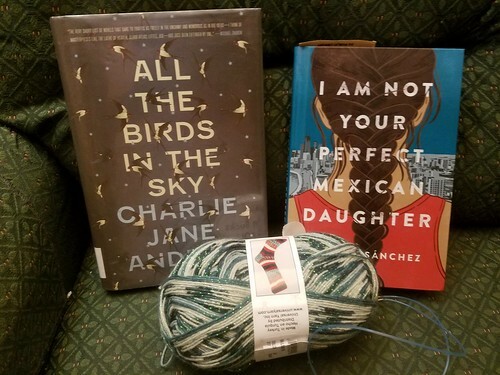 All the Birds in the Sky and I Am Not Your Perfect Mexican Daughter are both overdue with holds on them at the library, so I’m hoping to quickly get through them both and hand them back in for the next person. Obviously, if I feel like that’s going to take more than a couple days, I’ll just return them, but I’d really rather get to finish them. 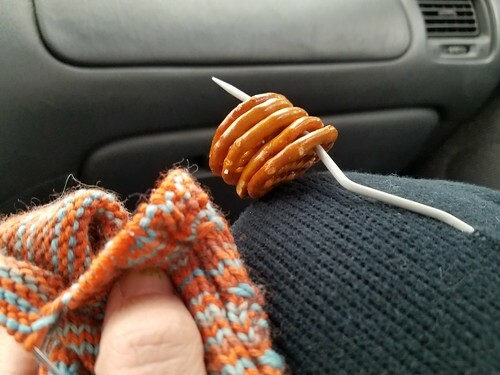 Head over to As Kat Knits for more posts on knitting and reading. Tasting: Right now, tooth paste, because I’m literally this blog post’s length from getting into bed. But before that it was reheated tea and peanut butter M&M’s (the candy was raw) to give me enough energy to wash the dishes, put away the leftover pizza, and get ready for bed. Smelling: Nothing, which means the litter box soaking in the tub must be ready to be emptied, dried, and put back into circulation. Seeing: All the bags in my living room. We haven’t unpacked from our trip north and tonight we went shopping for my contributions to our office adopt-a-family charity and didn’t get home until almost 11. We’ve already agreed tomorrow we’ll put everything away after we get home. Feeling: How sharp Corey’s claws are (Apparently trimming them is also on tomorrow’s agenda. ), but how soft his fur is. The warmth of the quilt. The ache in my back. Tired. Those last items means it’s time to put the computer away and then put me away for the night. See you tomorrow! Oh, but before I go, one last thing: There’s still time to sign up to take part in the the Virtual Advent Tour if you’re interested! I sent out emails today to everyone who asked to have a date or two, so if you left me a comment (saying anything other than that you’d be back in touch yourself this week), you should have a message from me. Once I hear back everyone is okay with their dates, I’ll post an updated schedule. And I’ll get badges done tomorrow or Thursday in case anyone wants one. We begin on Friday! 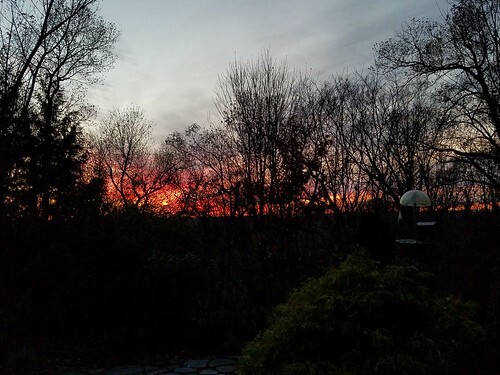 The weekend in Connecticut was lots of fun. I got to see my folks, my brother, and my best friend. There was a lot of talking. I watched the parade, some old and a new-to-me holiday movies, and a nice chunk of the Great Performances‘ taping of Holiday Inn. There were old favorites consumed and new favorites sampled. I helped bake rolls, roll pie dough, mash potatoes, and make gravy. I decorated several dozen spritz cookies. I drank hot egg nog and ate gingerbread cake. I helped my parents set up Christmas trees (or, at least, to get them indoors) and did some Christmas shopping. I vegged in front of the fire, finished some knitting, and got a little reading done. I did not get to go through many of my boxes in the basement. And while there was a lot of time in the car, there was no time in the office for six whole days! I hope you all had a nice holiday weekend, too! Sending updates on the Virtual Advent Tour. 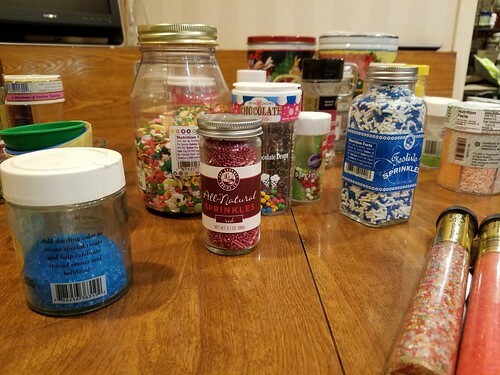 Prepping for my Christmas tree trimming party on Sunday. Baking for my office cookie contest on Thursday. Starting a new knitting project and maybe a new book. Turning to the final page in my calendar. Sounds busy, but doable. What do you have planned for the upcoming week? 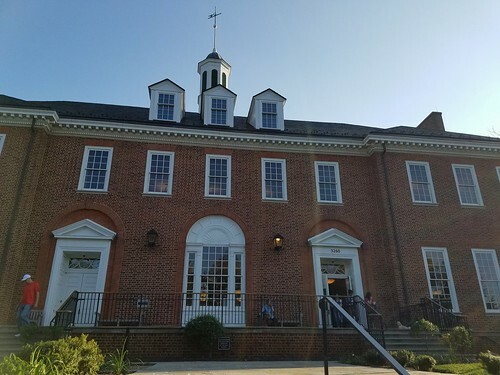 I forgot to take photos of the Georgetown Library interior when I was there on this day, so the indoor shots are all from a month later. The Georgetown Neighborhood Library has been my regular library for the past couple years, when the West End branch closed for renovations. I usually stop by once a week or so and then often head down to the waterfront to read for a while. The building was opened in 1935 and used to be a much darker place. (I wrote a paper on Siddhartha there when I was a senior in high school visiting my dad, who was working in D.C. at that time.) But it had a fire in 2007 (coincidentally the same day Eastern Market suffered a similarly devastating fire) and was rebuilt at that time, reopening in 2010. Category: books,dc life,sports. There is/are 2 Comments. I hope you had a nice week and are looking forward to a weekend that might include Small Business Saturday shopping around your town or maybe some baking or reading or crafting. I’ll be spending the day with my best friend, Karen, which is always one of the highlights of coming north.